Captiva Spine, Inc., a medical device organization dedicated to developing and distributing spinal technologies (in the U.S. and globally), today announced that it has received 510(k) clearance from the U.S. Food and Drug administration (FDA) to market the TowerLOX™ Minimally Invasive Lumbar Surgery System. 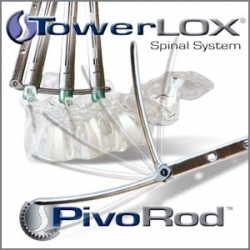 The TowerLOX Minimally Invasive Lumbar Surgery System was developed by Captiva Spine, in collaboration with spine surgeons and industry experts, to provide simple and intuitive function in a cannulated pedicle screw, tower and rod delivery system. The TowerLOX™ system is complemented with a proprietary rod delivery system, PivoRod™, that allows the surgeon ultimate control during percutaneous (minimally invasive) rod insertion. Captiva Spine recognizes the importance of providing a reliable rod insertion method, even in the most challenging anatomical situations. This is accomplished by continuously controlling the angle of the spinal rod to optimize the insertion approach required for rod delivery into each pedicle screw. The purposely designed mechanism for screw extensions ensures simple assembly and disassembly to the polyaxial screw. Captiva Spine recognizes the importance of a design that provides for intuitive and reliable attachment to the screw extensions during minimally invasive spine surgery. Captiva Spine will be exhibiting at the North American Spine Society Meeting next week (October 24-26) in Dallas, TX. Captiva’s newly FDA cleared minimally invasive spinal system will be demonstrated at booth# 1941. Distribution inquiries are welcome. Founded in 2007, Captiva Spine is a privately owned medical devices organization headquartered in Jupiter, Florida. The company’s mission is to provide the marketplace with a comprehensive range of reliable high quality spinal technologies. Our core competency resides in our ability to understand the reality of the operating room, allowing the organization to identify and develop tangible spinal solutions. Captiva Spine markets a full range of fusion technologies in the U.S. and Internationally.